Nicole Dubuc has been a writer, producer, and director for many beloved animated TV series. She wrote three episodes of Star Wars Rebels and several episodes of Forces of Destiny. She started her career as a child actress (she played Bertha in the 1986-1988 series Our House and Robin Cooper McGillis in the 1989-1993 series Major Dad) and is currently the showrunner of the upcoming Disney Junior animated series The Rocketeer. 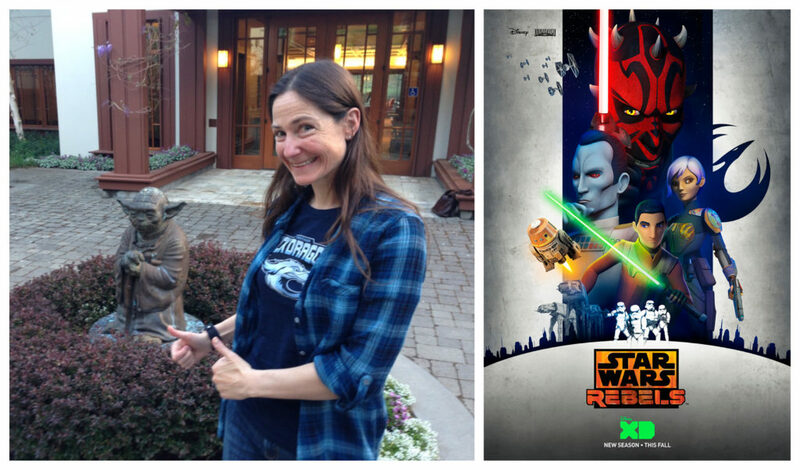 Nicole was kind enough to answer a few questions via email for 365 Days of Star Wars Women. What was your introduction to Star Wars? Is there a film, TV series, book, or comic that was your favorite? I first encountered Star Wars at a summer program at CalArts, in high school. One of my friends had the original trilogy on laserdisc, and we watched the whole thing in a theatre with a few of our friends. I was immediately hooked and wanted more. I started buying the books and burned through all of them. My favorites were Timothy Zahn’s Thrawn trilogy. Your career started early as an actress on the TV series ALF and then more regularly on Our House and Major Dad. How was that experience overall and did you have any inkling that writing and producing for television would be in your future? When you went to Yale did you always think you would come back to Hollywood? I am very grateful for my time in front of the camera, because I think it taught me script format and story structure at an early age. Also, I learned fast that no scripted joke is sacred, as we’d have to memorize punch ups on the fly. I knew I wanted to be involved in some form of the industry, but through high school I started to prefer behind the camera work. I had no idea what I would do after Yale – pre-med courses and an English degree helped me cover all my bases, LOL. But I’m glad I found my way back to Hollywood. How did your career as a television writer start? Was your goal to write for animation? I had always loved watching animation, but I fell into my career when the dot com I was working for went under. My co-workers, mostly from Disney animation, told me they could introduce me to some of their colleagues. The producers I met with very kindly read my work and gave me advice – letting me take a crack at writing a spec for their show with the promise that if they liked it, and they got a second season, I could write for them. They did, and they brought me on as an apprentice staff writer on Kim Possible. 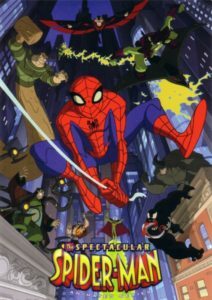 You’ve written for several animated shows where you have done two or three episodes (The Spectacular Spider-Man, The Octonauts, and Jake and the Never Land Pirates) how does this work. Did you pitch these series story ideas for a few episodes or did they approach you? Many times when you’re freelancing, you work on a lot of shows at once, so you do a few here and there. Usually the team reaches out to see if you’re available, and you come in and pitch. Sometimes the show just needs a writer to come in to write from a premise that’s already been approved. Going along with the question above how did you end up writing three episodes of Star Wars Rebels third season? Kallus played a large role in both “Through Imperial Eyes” and “An Inside Job” and Thrawn appeared in all three episodes. Did you enjoy writing about so many fan-favorite Imperials? I met with Henry Gilroy and Steve Melching when season three was getting started up, and they brought me on the writing team for the season. I loved the episodes I got to write. Timothy Zahn created a brilliant, fascinating villain in Thrawn, and trying to channel the Rebels version of the character onto the page was delicious. The third episode you wrote for Star Wars Rebels “Hera’s Heroes” was one of my favorites of the entire series. How did you go about providing a bit of a backstory for Hera? Did you have a favorite Rebels character in the three episodes you wrote or any favorite moments from the episode of Rebels you wrote? Thank you, I’m so glad you enjoyed it! 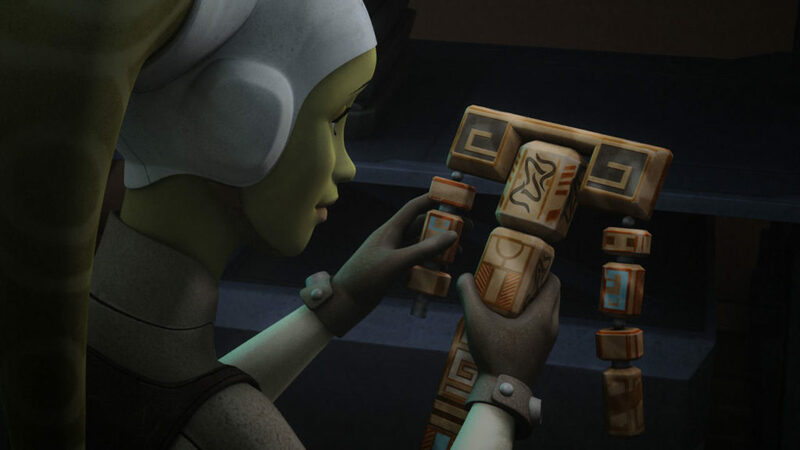 I did a lot of research on Twi’leks for the episode, as well as Hera and her family specifically. I took a lot of time naming the kalikori (it means “beginning”). That’s my kind of research, by the way – very enjoyable to dig deep into the mythos of characters and their world. I have favorite moments in each episode – but in this one, the Hera-Thrawn interaction really makes me grin. Would you like to write for another Star Wars project? If so, any dream projects (characters/timelines)? On IMDB the first time you are listed as a staff writer is for Transformers Prime. Can you explain what is involved in being a staff writer for a TV series. Despite the internet’s claims, my first staff writing job was actually on My Friends Tigger & Pooh. 🙂 A staff job means you’re part of a dedicated team of writers on the project. It often involves being in-house (as opposed to freelancing from home). Many times, the writing staff will come together to work out the arc of a series season (as on Prime), or break story together. In this way, we’re all a part of working out how characters grow and plot is placed throughout the season. It’s very collaborative. You also have several credits as a story editor. What does a story editor do on a TV series? In animation, a story editor is above the writers in the show ranks. It’s up to them to give notes on scripts and rewrite freelancers and staff as necessary. They work closely with the executive producer (and sometimes, they ARE the EP). They’re keepers of the character voices and tone of the show – really steering the narrative ship. 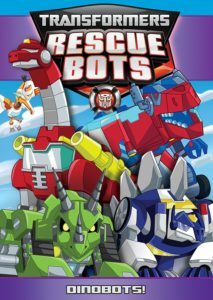 How did you end up writing the lyrics for the title song for Transformers: Rescue Bots? My son loves this show so this was especially impressive to him! Haha, I’m glad he likes it! I’d written a bunch of songs on My Friends Tigger & Pooh, so I just asked if I could take a crack at the lyrics for Rescue Bots. Our EP gave me the go-ahead. You have produced episodes of Transformers: Rescue Bots, Lego Elves: Secrets of Elvendale, and My Little Pony: Friendship Is Magic. How did you make the transition from writer to producer? Do you want to do more producing in the future? I really enjoy producing animation. One of my mentors, Jeff Kline, was always very inclusive with anyone on staff who wanted to learn more about the production side, so he invited me to attend mixes and animatic edits back when I was staff writing. Bit by bit, I learned about the process, and so when I was offered an EP role, I felt prepared to make the transition. Tell me about the short you directed Mike DA Mustang. Did you enjoy wearing both the writer and director hats on that project? It was a good challenge to try my hand at directing for the first time and definitely a learning process. I’ve worked with some fantastic directors, and I am in awe of their talent. Animation directing is a nuanced skill-set, requiring artistic chops, acting skills, and a cinematographer’s gifts. I’m happiest collaborating with amazing directors as the writer on the project. You have worked on projects for some of the biggest pop culture creators (DC, Disney, Hasbro, Marvel). Do these studios work in different ways that change your work process? Is it hard to jump back and forth between projects coming out of different studios or do you usually work on one project at a time? I’m almost always working on multiple projects at once. Each studio has its own tone/brand of humor, style, and storytelling. While the work process doesn’t really change (except, say, if you’re coming in to a writing room to break a story vs. working at home), it’s important to tune your style to the show’s voice. 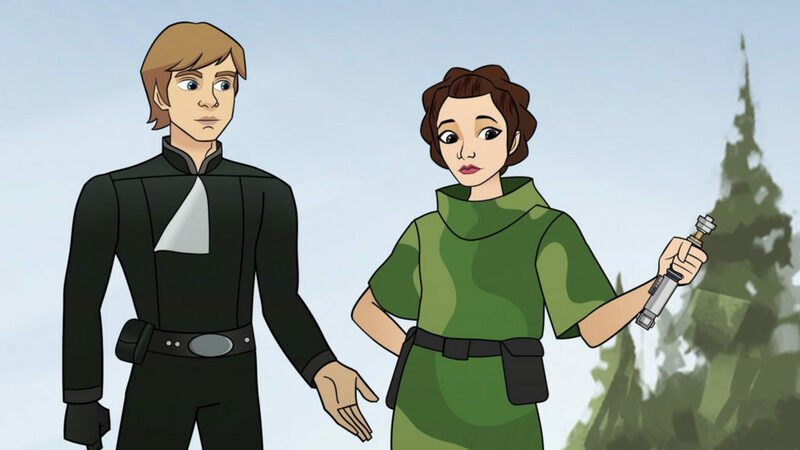 Can you share what episodes of Forces of Destiny you wrote and if you had any say about what characters or time periods the episodes focused on? I wrote all the episodes in the last half-hour of Forces of Destiny (I believe it’s the fourth episode.) In preparation for writing, I met with Dave and the Lucasfilm Story Group, and we all pitched our ideas for which characters and moments we’d like to delve into for the show. Do you think it’s important to have women writing Star Wars stories in shorts, TV series, and film? I think it’s important to have women writing in all franchises, genres, and media. Sure! I’m currently showrunning a preschool reimagining of The Rocketeer for Disney Junior. Looking forward to sharing it with you next year! Here’s a tweet from Disney Junior with a sneak peek at The Rocketeer. And here’s “Monster Misunderstanding” – one of the episodes of Forces of Destiny Nicole wrote.